Is anyone out there going to Rachael Ray's annual fundraiser in Lake George at her former high school? 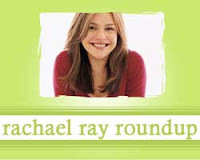 If you are, a devoted Rachael Ray fan and ERR reader is looking for an extra ticket! Email me (everythingrachaelray at gmail dot com) and I'll put you in touch with my buddy David. Kathy of Kathy's Kitchen made Scotch Salmon with Farfalle for her Good Friday Pasta. Itzy's of Itzy's Kitchen made Asian Turkey Burgers. N' Stiches Designs features a Rachael Ray recipe for chicken nuggets that was adapted to be gluten free. Alison Sherwood of the Post College Kitchen made an Easter Brunch menu that was inspired by Rachael Ray. Donna of My Tasty Treasures made Bacon Sloppy Joes. Little Gems by Kari features an adaptation of Rachael's recipe for Chicken Salsa Verde Bake. The Duncan Five features a recipe I really have to try - Pumpkin Crunch Cake. Dining Alone has a review of Rachael's recipe for Spring Pea-sto with Whole-Wheat Penne from Just In Time. Check out the recipe for Potato Scallion Soup with Fried Matzo Dippers on The Peppertree. Hi! Thanks for including my blog post! I found this after someone came by to visit! WE LOVE RACHEL RAY! My sister in law's do to and we are always swapping Rachel Ray recipes and giving each other cook books. I am so glad to find you!